I love making cards but scrapbooking digitally has become such a great thing for me! I just purchased a color laser printer so that I can print right at home and not have to send away for things. It was a big investment but seeing as how I have about 15 years of things to scrap it will save me money in the long run. Anyway....here's what I came up with. I used Stampin' Up! My Digital Studio. I love it! I got it from my demonstrator Anne, she's awesome and always answers anything I have questions about. Thanks Anne! 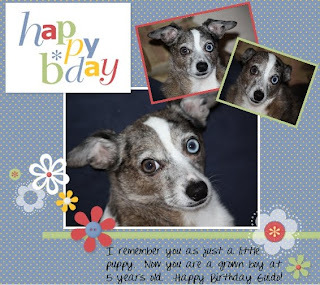 My dog Guido is having his 5th birthday soon and since I don't have "real" kids, my dogs are the next best thing. Happy birthday Guido! Associated Content Wrote An Article About Me! One World One Heart Winner! One World One Heart Giveaway! It's A AiFactory Meet The Design Team Blog Hop!